BAE Systems has signed a 15-year deal with the Ministry of Defence (MoD) to supply the UK armed forces with small arms and medium-calibre ammunition. It also includes mortar bombs, tank, artillery and naval gun shells, but not weapons such as guided missiles. The contract safeguards 1,700 jobs at factories in Crewe, Glascoed in South Wales and Birtley in County Durham. The MoD said the deal, initially worth about £2bn, ensured frontline forces had a secure supply of ammunition. The MoD said the contract could rise to a total of £3bn, depending on how much ammunition was ordered, and covers about 80% of the munitions used on operations and training. The deal should allow BAE to carry out much-needed modernisation work on the munitions factories, while a £120m investment programme will improve efficiency. 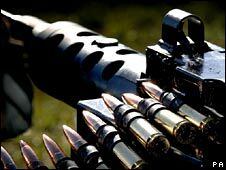 The Minister for Armed Forces, Bob Ainsworth, said: "Today's partnering agreement secures the long-term supply of ammunitions to our armed forces." "The 15-year programme will ensure that the UK has a modernised, sustainable munitions industry which will support British jobs and protect our capacity to produce ammunition," he added. "It is absolutely essential to the conduct of operations and training that we have a guaranteed UK-based high quality source of ammunition. This contract provides precisely that." Charlie Blakemore, managing director of BAE Systems Land Systems Munitions, said some machinery dated from World War II. "You can imagine that the rate of production that we are now at, it's been some achievement to keep that going in that period to make sure that we deliver on time." It comes a month after the House of Lords ruled the Serious Fraud Office (SFO) acted lawfully when it halted its investigation into a Saudi arms deal involving BAE Systems. The SFO dropped its inquiry into the £43bn deal with BAE Systems over fears it would threaten national security. Ministers said that the Saudi government had threatened to withdraw co-operation on security matters. The High Court had ruled in April that this was unlawful, but the Law Lords have reversed that decision on appeal.